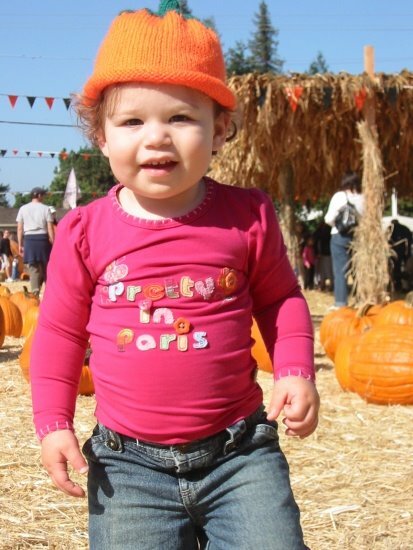 People, it is that time of year, and I demand pictures of children with pumpkins. Preferably the children should have pumpkin-like cheeks. Bonus points if the child is wearing some kind of pumpkin-like garb. You have your assignment. Now get cracking! We went to the patch for sure! Had some fun too! 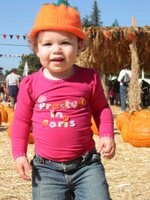 A mobile baby in a pumpkin patch near a busy road....next time I'll pick one out in a field some place! Ya live n' learn. Ha! What an adorable picture of A -- I love that hat! It just so happens that we DO have a pumpkin patch (or eight) in our neck of the woods. I've posted a short video above.